Please Note! 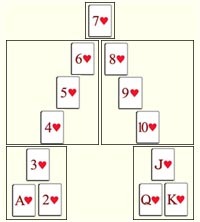 If you already have a firm understanding of number systems, and have been guided in your own way as to how such a system is effectively applied to the Cards, please utilize it in place of--or in combination with--what is presented here. 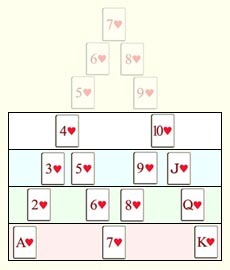 There are many different ways to interpret the numerical significance of the cards of each suit in the Book of Cards. This presentation has been greatly inspired by Willis Whitehead's book 'The Mystic Thesaurus'. Humanity has developed the language of 'Number' to represent the phenomenal reality of the cosmos. Before number can evolve however, there needs to be a space within which to work. This is represented by the zero. The zero provides the space for all possible evolution of number. It represents the potential of all number, while at the same time represents no number. The zero is drawn like a circle (more like an ellipse) to represent that it has no beginning and no end. In our mathematics, dividing any number into zero will always return zero--not a good idea if you work in finance. In addition, dividing any number by zero is undefined (or is it infinite?). Note: The common number system that is in use today is called the base 10 number system. This means that there are 10 primary digits (0 - 9) that can be used in combination with each other to form a mathematical language. The potential of any digit is always the greatest number in its base system. So for the base 10 system, the number 9 is of greatest significance, and as we have seen, the number 0 will leave you with nothing (no-thing is a great idea if you are learning to let go, but it sure is an empty feeling). 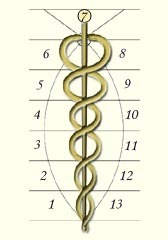 The phenomenal nature of the '9' has been described in 'The Mystic Test Book', 'The Mystic Thesaurus' (see Willis F Whitehead), and other such mystical sources that would fill volumes if all tabulated and correlated. For the purposes of this study, the '9' will represent the culmination of our evolutionary process, as well as the location allotted for the adjusting and balancing of all limitations encountered through such evolution. One - The symbology of 1 was (probably) first described as a circle (zero) with a dot in the center. In ancient symbology this symbol also stood for the Sun, or the source of all life (and number). From 1 comes everything else (of course without zero, one would have nowhere to stand). One is an expression of the state of pure consciousness, a representation of the infinite. Any number divided by 1 will always return itself. Therefore, 1 has been termed the number of identity. There is complete harmony in the state of 1, as there are no distortions present there. Equally though, since there is nothing but 1, there is no way to experience it; it just IS. But in the stillness of universal consciousness resides the harmonic principle of duality, in its potential state. Therefore, the Creator, in an effort to experience Self, projected the Soul into the realm of duality in order to create the opportunity for experience. And it is this projection of Creator that then is exposed through the principle of number. Two - Though 2 can be visualized as a product of 2 ones, it is also in and of itself, prime. Two, as represented by duality, exists in a myriad of forms throughout the cosmos and, as such, must be considered as an entity all of its own. In the realm of duality (2), we have the phenomena of, for instance, the laws of attraction and repulsion, the polarities of yin and yang, the numbers odd and even, cause and effect, etc. In this dualistic realm, one cannot be created or destroyed without also creating or destroying its counterpart (see "The Mystic Thesaurus"). Three - Three is the first created number, being the product of 1 and 2. It exists as the union of 1 and 2, being the child of that union. It cannot exist without either one of them, and as it dissolves, it returns to them. Due to the requirements just stated, 3 is best represented as the number of creation, or of that which is created. Four - Just as 1 corresponds to 2, 2 corresponds to 4 in a similar way. Thus 4 is also revealed as a prime number. The best example of this is the symbol of the '+', or cross. It is not enough to say that the circle is divided by 2 twice. Four represents the phenomenal manifestation in nature described through the 4 directions, the 4 suits, the 4 elements, the 4 cardinal points of the zodiac, the angles of a square, etc. Due to its association with the manifestation of nature, it best represents the structure through which the cosmos is built. Seven - The product of the 3 primary numbers (1, 2 and 4) gives 7, which has been termed the number of Potency. The numbers 5 and 6 are created numbers from the primaries 1 + 4 = 5 and 2 + 4 = 6. When we build a triangle pointing up of the prime numbers (1, 2 and 4), and intersect it with another triangle of the created numbers pointing down, you have the diagram at the left. This figure, representing the interlocking of 2 triangles, will be found in a number of metaphysical and mystical texts. In 'The Mystic Thesaurus' this has been termed Solomon's Seal. Number Base Set - Any number system will have a unique set of numbers that represents its base set. Our common number system is the base 10 system, represented by the numbers 0 - 9. Every digit represents a placeholder that can contain any number of that base set. When counting goes beyond the largest number of a base set, an additional digit is added to the front of the number and counting starts again with the lowest number of that base set. This fundamentally represents an octave shift, or harmonic. Since there are 4 suits, I have grouped the numbers representing the members of a suit into 4 sets as shown below. 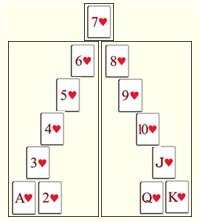 The diagram on the left below shows that the number 7 is at the center of each suit as represented using the suit of Hearts (see 'The Mystic Test Book'). The remaining 3 diagrams show that the groupings are done such that the 7 stands alone, and represents the fundamental connection that our Soul makes between Spirit (Father/Heaven) and Matter (Mother/Earth). These groupings have been provided simply to inspire the reader with ideas as to how to approach the representation of number as it relates to the birth card of an individual. 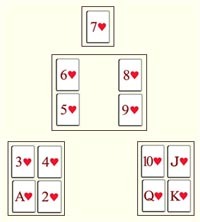 There are numerous representations that could be made regarding the numbers that represent a suit of the Book of Cards. Let's take, for example, the diagram above representing 2 sets of 6 members each (2nd from left) - leaving the 7 to stand alone as described above. The first diagram signifies that an event occurs when the 3 primary numbers align to form the triangle of Spirit (top circle). The manifestation automatically creates the dualistic counterpart, being the triangle representing the 3 created numbers of Matter (bottom circle). Astral Magnetism draws them together as shown in the 2nd diagram. It shows that at the merging of the heavenly and earthly triangles, the number 7 is created, representing the spirit behind manifestation. At the moment that the interlocking triangles converge (2nd diagram), another event occurs (as 1 is to 2, 2 is to 4) which is shown in the 3rd diagram. The top circle represents our physical plane opportunity to contact spirit, and the bottom circle is a spiritual plane replication of the top circle as each number transits through the 7 revealing its higher octave aspect. When any number in the bottom circle is added to its counterpart--that number opposite it through the diagonal--we get the number 21, or (3) 7's. When 21 is reduced to a single digit it adds up to 3 (shown in the center). The number 3 is the first created number--being a product of the prime numbers 1 and 2--and is related to the act of creation, or evolution. Here we have what appears to be the authority granted the Soul to incarnate, essentially the power behind the event occurring in the 2nd diagram. In the 3rd diagram we can see that for every point in the top circle, we have our higher octave aspect in the bottom circle. Diagram 4 shows this relationship as the number system is laid out over the chakra system. Here we find that when the pairs of numbers at each chakra level are added together we get 14, or (2) 7's. When that number is reduced to a single digit we are given 5, the number of Soul. This shows that the purpose for the journey into physical manifestation is for the evolution of the Soul. 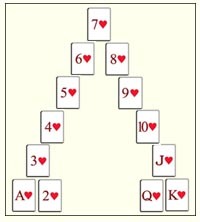 As another example of how the number groupings can be analyzed, notice the suit of hearts being broken into 3 groups of 4, leaving the 7 to stand alone. Grouping the numbers into 3 sets of 4 (3 squares of 4 points per square) produces a wonderful arrangement, especially from the standpoint of symmetry. If we take the figure (Solomon's Seal) representing the interlocking triangles shown above --2 triangles having 3 sides each--and extend that, we get 3 interlocking squares. When you take any point and add to it its complimentary point (that which is directly across from it through the diameter), and reduce that to a single digit, you get the number 5. The number 5 has often been described as the number of the Soul. Using this new orientation, we now have 4 quadrants having 3 members each. The 4 quadrants relate to the 4 suits--and the 4 elements being fire, earth, air and water--and the 3 members relate to the 3 qualities of the zodiac, being cardinal, fixed and mutable. The alignment of a number with an element and a quality should be considered graphically, rather than literally. The 7 stands alone and acts as an ambassador of humanity to our spiritual counterpart (see Higher Self). 1, 5 and 10 - These deal mainly with our fundamental connection to the cosmos. Similar as to how Aries is the first sign of the zodiac, 1 (and its related members) are first to venture out to greet the day. They may have a sort of pioneering energy about them, having the courage to start new ventures. These numbers hold the presence of the One. 2, 6 and J - These deal greatly in the realm of duality. The ebb and flow of nature is a great influence on them, and as they seek to find the proper solution to the workings of nature, the earnestness of their search guarantees their successful journey through it. These can be thought of as the Shiva-Shakti connection. 3, 8 and Q - These work most effectively in the realm of the Trinity. They are the Child of the Father-Mother God. For these numbers to become aligned with their highest purpose, they often need to play all 3 parts of the trinity; being that of the lover, the one being loved, and Love itself. But before they can reveal that, they often need to be the forgiver, the one being forgiven and Forgiveness itself. 4, 9 and K - These are the masters of structure. They represent the culmination of all previous number groups, as well as standing in as the archetype for humanity (the 4th dimension). Through these numbers the true Purpose of humanity will be revealed. By aligning with the work required by each of the previous number groups, and actualizing that work required, the the value of their powerful position will be revealed. From this vantage will these numbers lay out the new architecture for our social evolution. In addition, analyzing each of the 3 squares we have the 1st group of 1, 2, 3 and 4, followed by the 2nd group of 5, 6, 8 and 9, and finishing with the 3rd group of 10, J, Q and K. Each of these groups can be analyzed as a whole, where generalized qualities may be associated with each. Standing outside of these groupings is the 7. It acts as a pivot point through which members within each group align with their counterpart in the other associated groups. In addition, the 7 acts as a conduit between our mundane reality and that of our spiritual counterpart (see Higher Self). The diagram on the right is the orientation that I use most often for analyzing number. I find that it best represents the folding action of these numbers. In the story of creation, God created the World in 6 days, and on the 7th day he rested. This story correlates exactly to how the zodiac has been used to expose the division of the lower 6 chakras, with the 7th chakra being transcendental. In the state of 'Rest', all conscious activity has ceased and the mind is in a state of contemplation. The first folding happens about the 7, with the 6 physical chakras aligned as the left leg (looking at the diagram). These 6 chakras are associated with our conscious mind, whereas the second 6 chakras, numbers 8 to king, are associated with our subconscious mind. The numbers 5 to 9 at the top are shaded to indicate that they too will fold, this time about the 4. This second folding is fundamental for the human kingdom as we live in the realm of the 4th dimension. All dimensions beyond the 4th are mirrored and reflected within. With this configuration, the numbers 5 to 9 provide access to either our super-conscious or unconscious mind. Our karmic history bubbles up from the unconscious, providing the evolutionary work to be done in our waking life. Through the interaction, and cooperation, of the conscious mind and subconscious mind, the intuitive body awakens in reflection of our super-conscious mind. The descriptions presented above are provided as examples, and are intended to serve as inspiration to the reader in awakening their own journey through the number system. I feel that it is best that each card reader do their own research in numerology, which will naturally uncover meanings for these numbers that are most attractive to their driving desire.